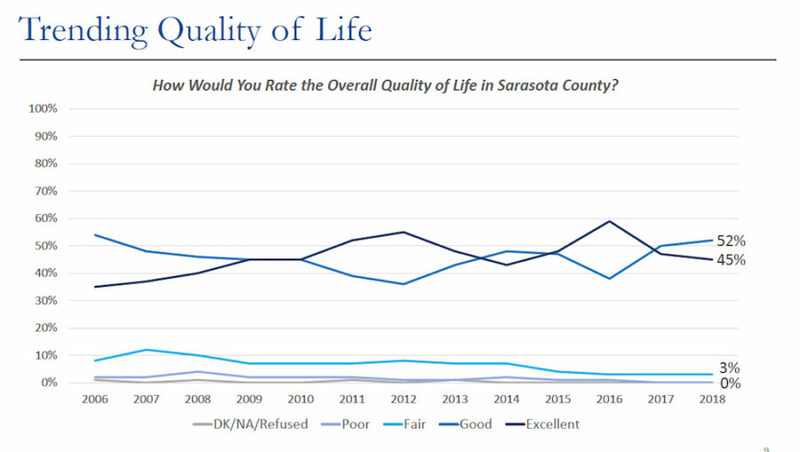 Just as they did in 2017, 97% of the respondents to the 2018 Sarasota County Citizen Opinion Survey said their quality of life was good or excellent, according to research undertaken this summer by the Institute of Government at the University of South Florida, on the county’s behalf. However, Sarah Treichler Lindemuth, senior research director of the Tampa firm HCP Associates— which partnered with USF on the survey — reported to the County Commission on Sept. 12 that this year, a larger percentage of the respondents rated their quality of life “Good” — 52% — compared to those who said it was “Excellent” — 45%. A growing shift between those two answers has been evident over the past three years of the survey, she pointed out. 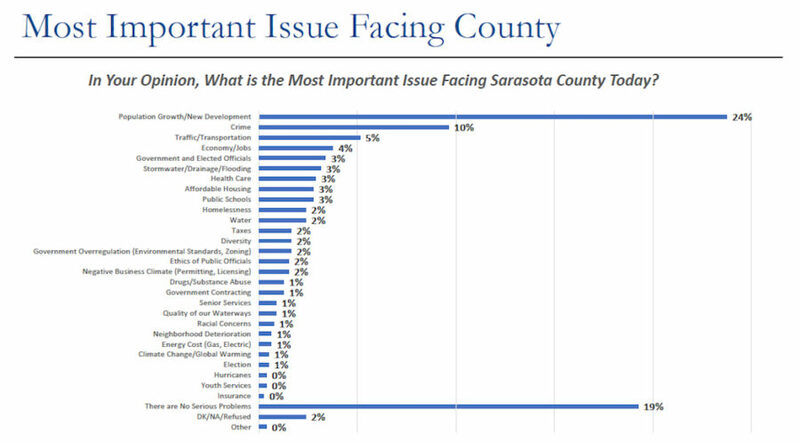 And, once again, “Population Growth/New Development” was the highest-rated answer to the question, “In Your Opinion, What is the Most Important Issue Facing Sarasota County Today?” That has been the top answer since 2014, according to a chart Lindemuth showed the board. Out of this year’s 800 respondents, Lindemuth said, 24% concurred on that answer, just a tick up from the 23% who put it at the top of the list in 2017. In the latest survey, she continued, “Population Growth/New Development” was followed by “Crime” at 10%; “Traffic/Transportation” at 5% and “Economy/Jobs at 4%. In the 2017 survey, “Taxes” was in second place, with 8%, followed by “Homelessness,” “Crime” and “Economy/Jobs,” all at 5%. In regard to crime, Lindemuth indicated that most respondents referenced neighborhood incidents and personal safety. The extensive news reporting on the hiring of school resource officers in the wake of the Parkland student shootings in February could have had a bearing on “Crime” getting a higher rating this year, she added. Of this year’s respondents, 90% said they were given the correct information — compared to 95% in 2017 — and 89% said they were helped in a timely fashion. The latter figure was 93% in 2017. 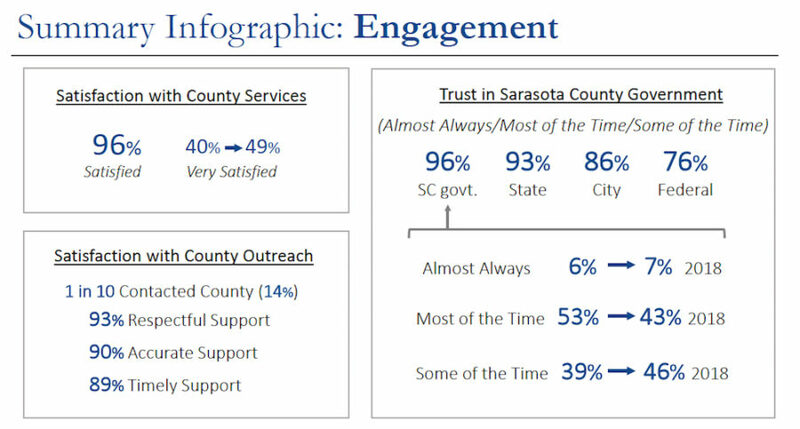 Additionally, 96% said they are somewhat satisfied (47%) or very satisfied (49%) with services the county provides. Last year, 40% of respondents were very satisfied, and another 54% were somewhat satisfied, for a total of 94%. He also noted the high number of people who contact county staff about problems as wide-ranging as potholes and stopped-up stormwater drains. Commissioner Michael Moran also offered his congratulations to the staff. 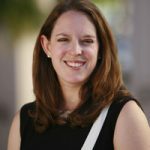 Early in her presentation, Lindemuth explained that the survey responses resulted from random sampling of 800 county residents age 18 and older. The interviews were conducted between June 25 and July 17, she said, and the average time to complete the survey was 9.8 minutes. The researchers worked to make sure the survey reflected the county’s demographics. The margin of error, she added, is plus or minus 3.5%. Responding to a question from Commissioner Paul Caragiulo, Lindemuth said 62% of respondents reported having lived in the county for 10 or more years; 23% said they had been residents for a period from six years up to 10; 11%, one to five years; and 3%, less than a year. Lindemuth also explained that the researchers used both landlines and cellphone numbers to reach respondents. This is the 27th year of the survey, she told the commissioners. 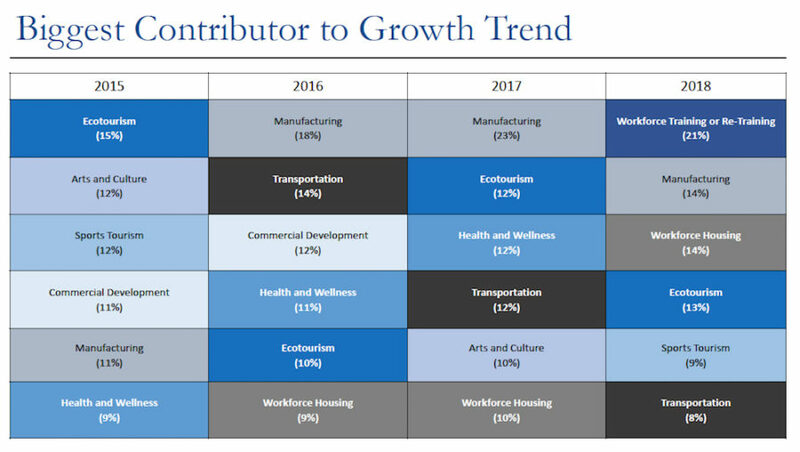 Turning to the question of the “Single Biggest Thing that Can Contribute to the Growth” of the county’s economy, Lindemuth reported that in the 2018 survey, 21% cited workforce training or re-training, while “Manufacturing” and “Workforce Housing” were both at the 14% mark. Tourism had higher marks in the past she said. This year, ecotourism came in at 13%, with sports tourism at 9%. Last year, manufacturing was in the top position, with 23%, followed by ecotourism and health and wellness, both at 12%. 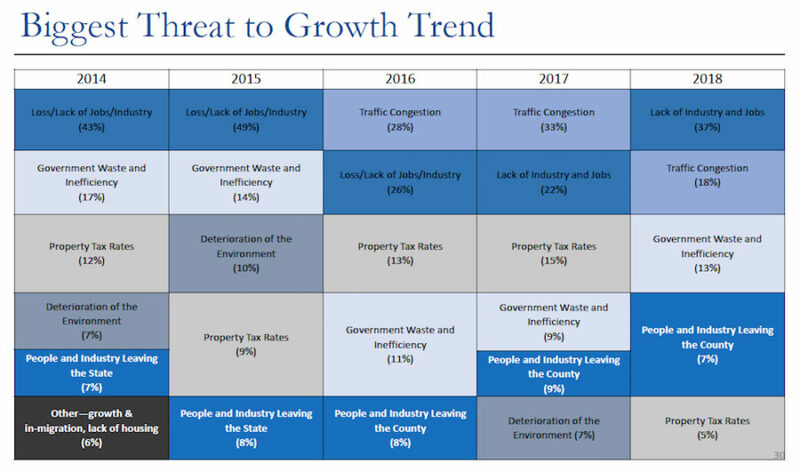 In 2016 and 2017, traffic congestion was in first place. Lack of industry and jobs came in at 22% last year. “I will use this opportunity as my annual nagging relating to workforce development and attraction,” Commissioner Moran said, referring to that group of statistics. 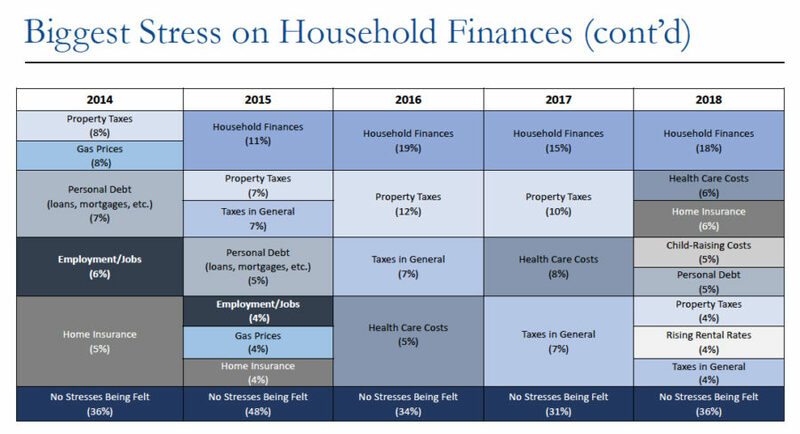 In response to the question about what puts the greatest stress on household finances, Lindemuth continued, the top answer — noted by 18% of respondents — was “Household Finances.” Those included repairs to houses, yard maintenance and pool service, for examples, she said. That answer gets more attention when the economy is good and people have more disposable income, she pointed out. The second highest-rated answers in that part of the survey were “Health Care Costs” and “Home Insurance,” both at 6%. “Personal Debt (Loan Repayments, Mortgage, Credit Cards, etc.) and “Child-Raising Costs” were at 5% each. “Household Finances” has been at the top of the list since 2015. Last year, it was followed by property taxes at 10% and health care costs at 8%. This year, “Property Taxes,” “Taxes in General” and “Rising Rental Rates” were at the 4% level. Combining the three answers netted the state government a 93% mark, the survey showed, followed by city government at 86% and the federal government at 76%. For county government, the “Most of the Time” answer declined from the 53% mark last year to 43% this year. However, the “Almost Always” figure rose from 6% in 2017 to 7% this year. One new question this year asked whether respondents were aware that the County Commission has been spending down its “rainy day” reserve fund since the Great Recession struck, so it could maintain the millage rate at the same level while it worked to keep service levels consistent. Sixty-five percent of the respondents did not know that was the case, Lindemuth said. 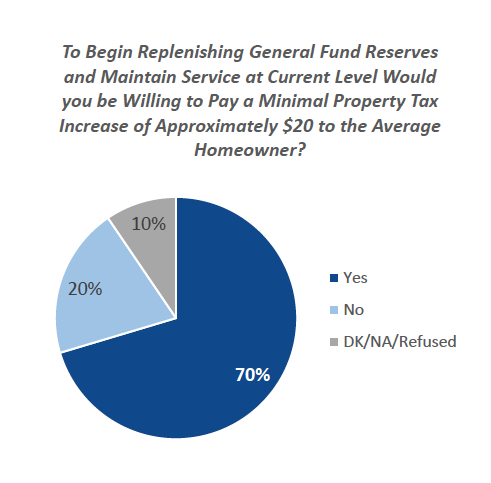 When asked how they felt about paying about $20 more in property taxes per average household to begin replenishing that reserve fund, she noted, 70% said they would be wiling to do so. Only 20% flatly said they would not.